Written by Ray Stefani on 11 September 2012 . The London Games have now come to an end and the city adjusts itself back to a more normal and recognisable setting. The host nation, Team GB, was honored with a victory parade on the streets of London yesterday with thousands lining the route and cheering the athletes on. Written by Jim Albert on 24 April 2012 . In sports, athletes are often defined by their performance statistics. Sprinters are defined by their best time in a particular race, soccer players are defined by the number of goals or assists, and basketball players are defined by the number of points they score per game. Written by Tristan Barnett on 17 June 2011 . The new challenge system for close line calls in tennis has been used on the ATP and WTA tour for grand slam events since the 2006 US Open, and was designed to increase fairness for players by obtaining accurate line calls and enhance spectator interest through video technology. 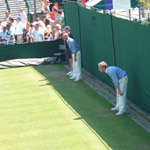 In the current system, players have unlimited opportunity to challenge, but once three incorrect challenges are made in a set, they cannot challenge again until the next set. If the set goes to a tiebreak game, players are given additional opportunities to challenge (usually one extra). If the match is tied at six games all in an advantage set, the counter is reset with both players again having a limit of up to three incorrect challenges in the next 12 games, and this resetting process is repeated after every 12 games. Written by Jack Miles on 21 April 2011 . On Sunday 17th April Emmanuel Mutai broke the London Marathon course record by coming home in a time of 2:04:40. This was less than a minute short of Haile Gebrselassie’s current world record of 2:03:59, but 4min 41secs short of a much talked about barrier in the world of marathon running – the magic sub 2 hour marathon. A hot topic in the running world; runners, commentators, and even some statisticians, are asking if/when will this barrier be breached? Naughty Millwall – but are they the worst behaved? Written by Matthew Revie on 22 February 2011 . On Saturday 19th February a soccer game between Millwall and Middlesbrough was almost cancelled due to crowd trouble. While the events must not be condoned, it is worth remembering that this is nothing compared to some of the scenes seen in English football during the 1980s where deaths were extremely rare, but not uncommon. The introduction of all-seater stadia after the Hillsborough disaster is largely seen as contributing towards the reduction of football violence. However, in recent years another tactic has been used by the police – banning orders. A football banning order is a preventative measure designed to stop potential troublemakers from attending football matches and can last between three and ten years.